As the serial number tattooed on the inside of my eyeball dictates, I’m a registered member of the Liberal Party. Why? Well, because I believed in Australia. I believed in the values that they purported, and the people they put forward. Mind you, this was back before the dark days today, one where I’m forced to write under a pall of anonymity, hidden by a mask of cartoonish stupidity. While it’s been rather too easy to blame our detractors (and I’ve fallen into this trap numerous times), I think it’s time we be honest and wipe the mirror clean and finally be honest with ourselves…it’s us, it’s not them. We’ve been worse than bad, we’ve been a self-flagellating nothing. The parade of disappointment has been easy to spot, as are the numerous white elephants soiling the pavement. Scott Morrison radicalised the youth of tomorrow against his party, deciding to insult children, with Matt Canavan derided them as “dole bludgers”, subtextually pushing the two parties to fisticuffs, probably in the hope that if the kids swing first and the assumption that they’d lose the upper hand in the argument. They’ve been selective in saving their own, seemingly fine with having the least number of women on deck in 25 years. The recent scripture unbelievably saw the Montagues and the Capulets of Auspol joining forces, with Tony believing that he could get his old job back, and Malcolm castigating Morrison for bending the rules to save his own. Both are calling for an election. Already we want to already topple Morrison, the man who saved us from Peter Dutton Prime Ministership. How quickly the worm turns, for never was a story of more woe, than this of Juliet and her Romeo. Last night, the clock struck twelve in the deserted halls of the Morrison government, as the sitting PM unexpectedly called upon his flock to toggle the rules, thereby making it harder for a sitting leader to be knifed behind a curtain. According to Morrison, more people will have to hold the blade. 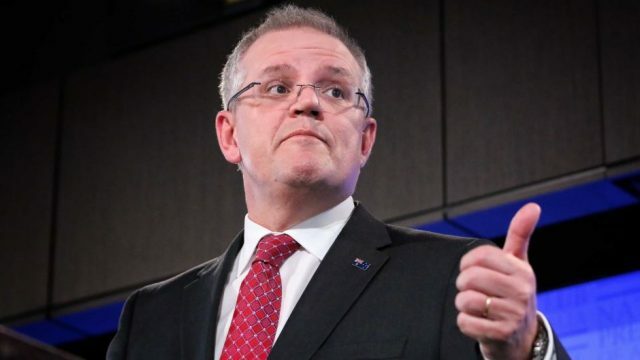 In the mind of Morrison, he’s ushered in a new age of stability, stating that the power to choose will solely* be in the hands of the populace. Which makes no sense, considering that no-one chose to give him the job in the first place. Morrison is the spoiled kid offering a panicked ‘no returns’ to the punch buggy he ruthlessly tagged us with, all in an effort to make sure that the rules were crystal clear, and mum has no power when she finds out. Liberal partyroom has passed new rules saying a sitting leader can only be rolled with a two thirds majority. @ScottMorrisonMP: The Liberal Party is returning the power of these decisions about who is PM of this country to the Aus people. This is not my beautiful home, this is not my beautiful wife. Well, how did we get here? I’m unsure, but an increasingly unpopular PM making sure he’s safe to make it to an election he’s absolutely going to lose is our new normal. The cherry on this particularly rancid pastry is the fine print, in that a leader that wins an election is safe(r) for the term. Which, of course, doesn’t apply to Scott Morrison. He’s saving tomorrow. The questio is, however, is if the rules can be retroactively applied, and whether said rules count for elections previously won. If so, welcome the renewed march of old foes. Hell’s teeth. Those are questions. But another is what happened to my party? The wrongdoing, the pans of corruption so obvious, so naked, it reels the mind. It’s akin to seeing a mugging in public, you’re frozen by the sheer unexpected gall of it. Morrison might be the preeminent purse snatcher we shriek in opposition to, but in reality, he’s merely a product of his environment. Morrison just wears the plague mask, the disease has already taken hold. We’re at the Chatroulette stage of government. No-one wants another spill, but grim curiosity forces us to push the button, blindly hoping for someone decent to appear in the mire of masturbators, the odd and the deranged. Another spill, or another election win safeguarded with the Morrison rule will not solve the issue, it will merely move the timeline back. The true trap lies in election day, we’re emboldened by the smell of democracy sausage and outright optimism that change is afoot, that this time, it will be different. It won’t be, because we allow the deck chairs to be scraped around the deck of the Titanic. It’s not a question of who leads the party, it is the party itself. The responsibility is on those who have rigidly given support, whatever the message. From Bronny’s helicopter to Tony’s table, from Dutton’s near miss to the time we spent focusing on Barnaby’s spawn, the modern Liberal Party has been a veil of tears. The only thing that will truly save the LNP is a Shakespearean end where everyone chooses grandstanding on the way to political death. That, or a Labor win at the next election. O happy dagger, this is thy sheath.